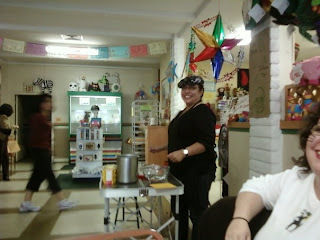 My first food demo at La Borinqueña took place at Days of the Dead Fiesta - Oct 31, 2009. Gracias to everyone that attended! I promise to have more demos in the weeks and months ahead. Place the water and the masa in a bowl and break up with your hand until there are no lumps. Transfer to a medium sized saucepan. Add the milk, chocolate. Bring the mixture to a simmer, using a whisk until the chocolate is melted and well-blended. Add sugar to taste. Strain the mixture through a medium sieve and serve hot, in mugs.